Moths have eyes that have evolved to absorb the maximum amount of light and thereby see even in the dimmest conditions. Researchers from the Advanced Technology Institute of the University of Surrey have taken design cues from moth eyes to develop a nanotextured decoupled graphene—a new material that could power future smart technologies. Graphene is a carbon-based material with remarkable properties including high electrical conductivity and superior mechanical strength. Despite these properties, graphene suffered from very poor light absorption because it is ultrathin—about as thin as one atom. This thinness only enables graphene to absorb a small percentage of the light that falls on it. Researchers S. Ravi P. Silva et al believed that to realise the potential of graphene as a material for future applications, it should also harness light and heat effectively. This means making graphene a suitable for the optoelectronic technologies demand by future smart technologies. Nonetheless, inspired by the inner workings of moth eyes, the researchers successfully demonstrated how graphene can be manipulated to develop one of the most light-absorbing material to date. Silva explained that the eyes of moths have microscopic patterning that allows them to see in the dimmest conditions. These work by channelling light towards the middle of the eye. Furthermore, by gathering light toward the centre of their eyes, moths are able to eliminate any reflections that could otherwise alert predators of their location. 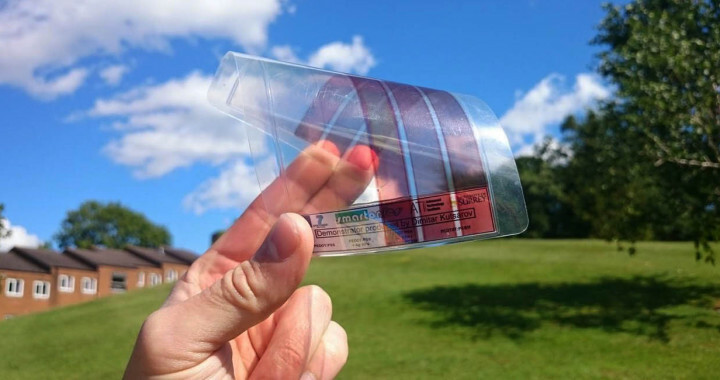 They used this same principle to make an ultrathin light-absorbent graphene-based material. The technique employed by the researchers has been referred to as nanotexturing decoupling. This involves growing graphene around a textured metallic surface and nano-patterning to localise light in the narrow spaces between the textured surface. This allows trapping the optical field coincident with few-layer decoupled graphene using field localization within a disordered distribution of subwavelength-sized nanotexturing metal particles. Result of the nanotexturing decoupling technique is an ultra-broadband light-trapping graphene. This material demonstrates broadband light–coupling effect from the disordered nanotexture combined with the natural thinness and remarkably high and wavelength-independent absorption of graphene results in an ultrathin yet ultra-broadband blackbody absorber. In other words, nanotexturing graphene has the effect of channelling the light into the narrow spaces between nanostructures, thereby enhancing the amount of light absorbed by the material. It is now possible to observe strong light absorption from even nanometre-thin films. The nanotextured decoupled graphene was specifically demonstrated to have an enhanced light absorption property. According to the researchers, the material has a 99 percent absorption spanning from the mid-infrared to the ultraviolet. Solar cells or photovoltaic devices are nonetheless the most promising use of this material. Silva mentioned that solar cells coated with nanotextured decoupled graphene would be able to harvest very dim light. Among possible applications include the development of so-called smart wallpapers or smart windows that could generate electricity using waste light or heat. It is important to note that solar cells operate by absorbing light first, then converting it into electricity. The most efficient cells needs to do this absorption within a very narrow region of the solar cell material. The narrower this region, the better the cell efficiency. The ability to strongly absorb light by these structures could pave the roadmap to higher cell efficiencies. The researchers are looking forward to incorporating this nanotextured decoupled graphene in a variety of existing and emerging technologies, including exploiting this material in existing optical devices for performance enhancement, whilst looking towards new applications. Take note that the University of Surrey has a dedicated Graphene Centre. The researchers noted that they are willing to work with industry partners to exploit further the technology as well as its future applications.